The keynote of this design is the dramatic, draped overlay with fluid gathers cascading from the shoulders and neckline, and sweeping down to one side of the hemline- super flattering and interesting style. Beneath the fluid overlay is an inner A-line silhouette that will fit many body shapes. -Extended wear designed for nursing / breastfeeding use. -Pleats detailing along front neckline. -Asymmetrical overlay camouflaging nursing access on inner body. Whether it’s a maternity top or nursing dress, determine your size based on your current bust measurement. Measure around the fullest circumference of your bust and refer to sizes as per the above to get the best possible fit. If you are in-between sizes, we suggest choosing the next size up, particularly if you are in the early term of your pregnancy. Each MEV size is designed to accommodate an anticipated extent of growth, particularly around the bust and belly circumference. 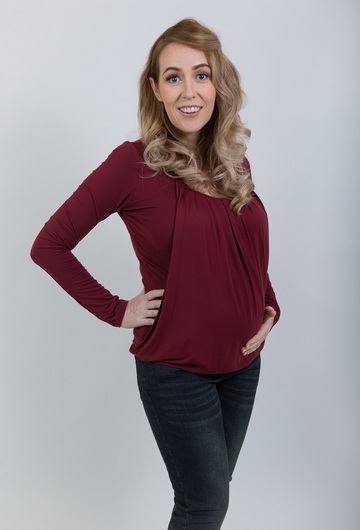 Crafted in high quality stretch fabrics, their designs shall fit you from when you start showing (probably around 16 weeks) and ideally, to the full term of your pregnancy.